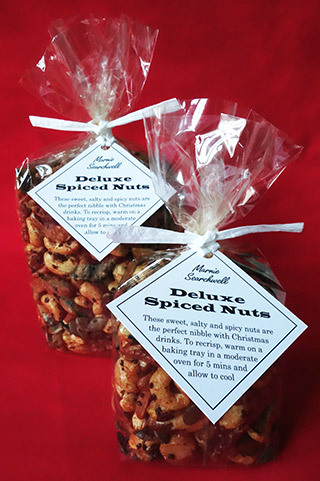 Sumptuous nibbles – a delicious bag full of nutty, seedy spice! 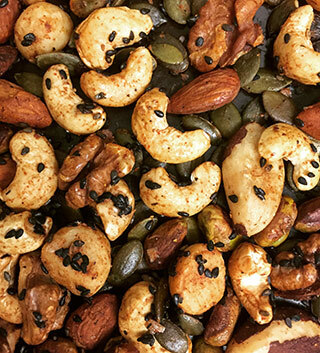 These delicious spiced organic nuts & seeds will start your party off with style. Guaranteed to satisfy, and great for sharing with friends and family – or for keeping all to yourself! I use only the best organic nuts: Cashews, Brazils, Macadamia, Almonds, Walnuts and Pistachios, as well as Pumpkin and Sesame Seeds. All mixed together with lightly whipped egg white, a big spoonful of dark Muscovado sugar, flaky seasalt, a spoonful of cumin and Ras el Hanout and sweet smoky Pimenton, and a pinch of chilli flakes. Gently baked in a warm oven until crunchy and golden. These delectable nibbles come neatly packaged in a crisp cellophane bag – they'll keep you coming back for more!